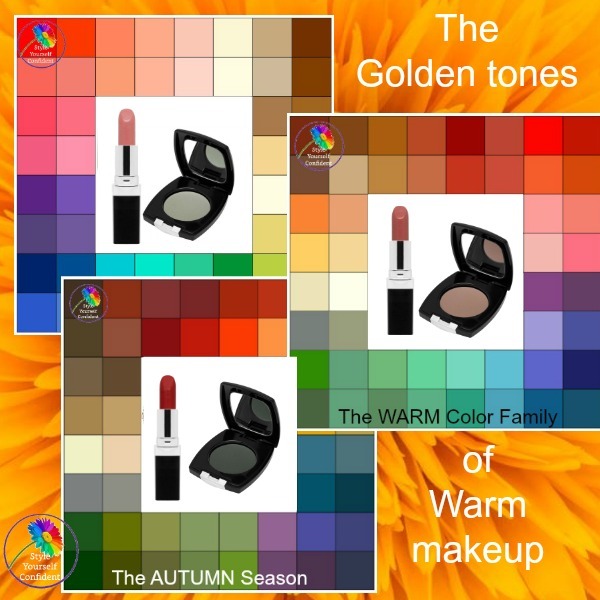 You may be WARM, SPRING or AUTUMN but if you have a yellow or WARM undertone to your skin you should choose Warm makeup shades to flatter your natural coloring. 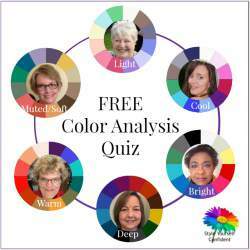 If you don't know your color family you may know that you look and feel good in the fabulous Warm shades I show below - golds, reds, turquoise and olive - then it's very likely you have a Warm skin. Luscious colors with a golden/yellow undertone - peach and apricot, copper and bronze. You should 'dress' this natural coloring by wearing complementary shades on your face and you'll be amazed at how your coloring comes to life - brighter eyes, clearer skin and more intense hair color. 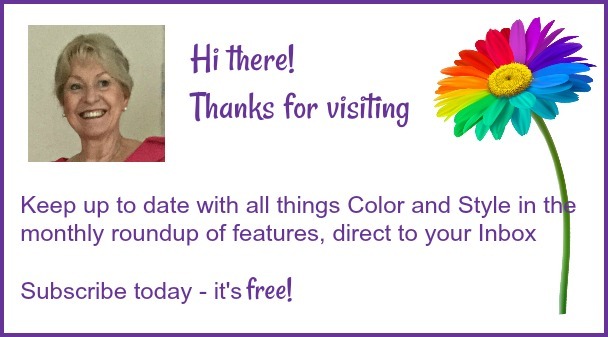 Whatever your age if you follow the color palette shades when choosing cosmetics you'll never go far wrong. This is how nature designed you to look your best! Once we reach middle age skin pigment begins to fade a little and it's even more important to make sure you choose the best colors for your complexion so that you continue to make the best of your lovely coloring. To make the most of Warm skin look for a foundation that complements this Warm/yellow undertone. Avoid a too 'flat' beige which will flatten your coloring. Older skin acts a bit like blotting paper and it can be uneven in tone which makes it difficult to achieve the look you want. By choosing makeup that's specifically designed for mature skins you'll find products that smooth and even the skin tone - extra coverage that lasts longer but never looks heavy. A primer worn under foundation will smooth the skin filling in open pores and fine lines leaving the skin looking soft and matte. It also ensure that your makeup stays on and looks fresh for longer. This lady belongs to the Warm Color Family and by wearing Warm makeup shades her complexion is complemented and her natural coloring comes to life. 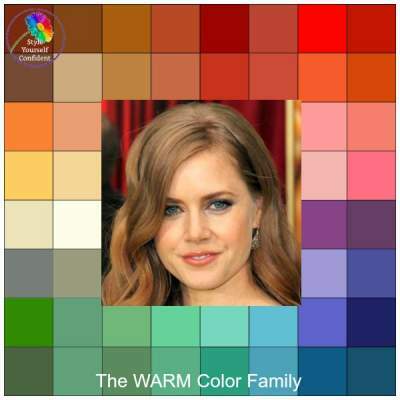 I'm featuring the lovely Amy Adams (below left) with Warm coloring and a fair skin, also Jennifer Lopez whose natural coloring is still Warm but deep and rich. They're both surrounded by Warm shades - lighter skin with lighter shades and deeper skin with deeper shades. FOUNDATION: should be matched to your skin tone as closely as possible and once you get the right tone you can wear it all year round. If you take a tan you can always add a little tint of color to the mix to achieve a deeper shade. Avoid a too 'flat' beige which will flatten your coloring. LIPSTICK: think of natural peach or copper, shiny bronze or terracotta, rustic or natural earthy tones to tone with your wonderful color swatch. Stronger tones can take a deep rusty red. Your pinks are peachy, always avoid harsh blue toned pink and burgundy. EYES: Natural tones of taupe, beige or warm brown for shaping and creamy highlighter for the lid. 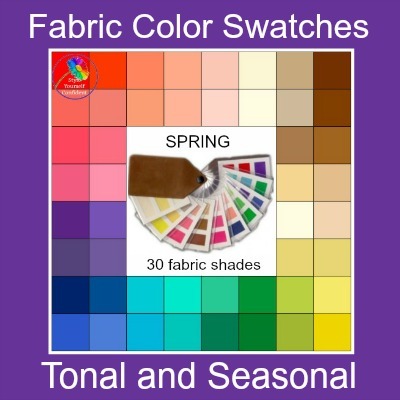 Choose beautiful dusky shades from the colors below for added color - subtle teal, olive, warm purple are yummy. BLUSH: Choose blusher with a peach or brown undertone. A peachy pink or pinkish brown would also work. Stronger skintones can choose deep terracotta and rusty browns. 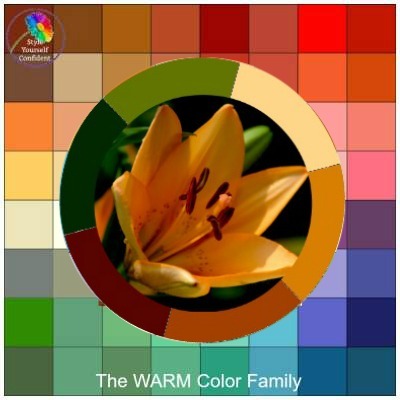 If your coloring is fair you'll probably want to choose the lighter and more gentle tones from this selection of colors. 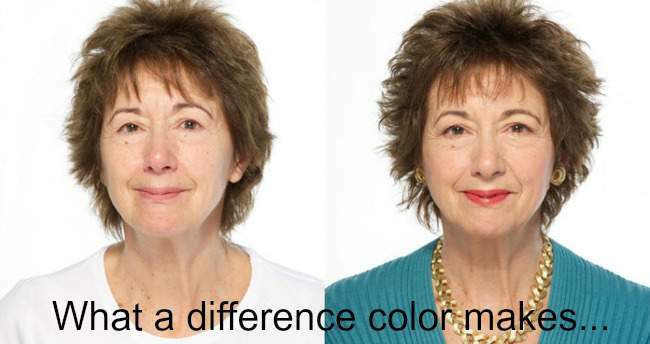 If you have darker hair with stronger coloring, you can take a stronger contrast on both your lips and eyes even though your skin may be only mid-toned. Look Fabulous Forever, who have designed makeup specifically for mature skin, have put together the basics to flatter a Warm skin - the Warm Collection. Look at the fabulous color palette created by this beautiful golden lily. The flowers and leaves are from the same color palette and therefore create complete harmony. 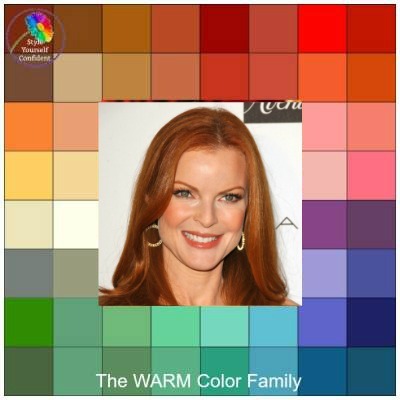 Marcia Cross has beautiful Warm coloring and 'sits' happily in the warm color palette too. This is how Nature always gets it right - your natural coloring works in just the same way. 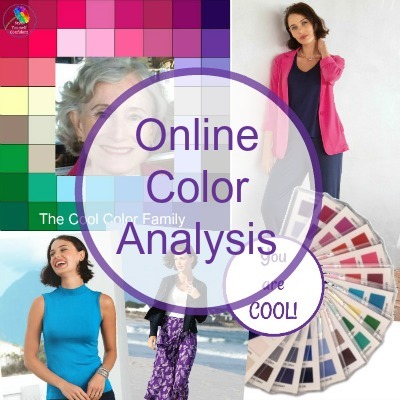 When you wear clothes and makeup in shades that echo your natural coloring you create COLOR BALANCE. Nature designed us so we can get our 'foliage' now.